Dale, Clarice. "Frank McGee". The Canadian Encyclopedia, 04 March 2015, Historica Canada. https://www.thecanadianencyclopedia.ca/en/article/frank-mcgee. Accessed 20 April 2019. 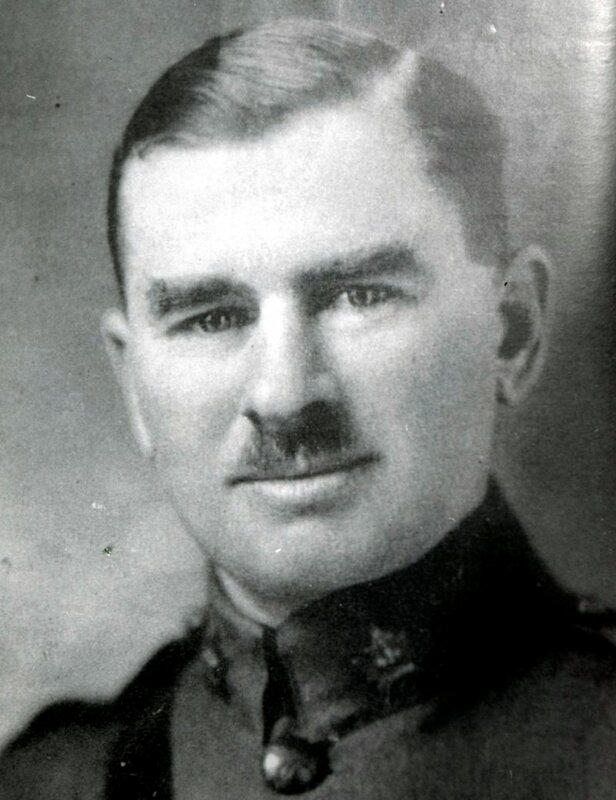 Francis Clarence McGee (One-Eyed Frank McGee), hockey player, army officer (born 4 November 1882 in Ottawa, ON; died 16 September 1916 near Courcelette, France). McGee led the Ottawa Silver Seven, considered one of the greatest teams in hockey history, to consecutive Stanley Cup championships from 1903 to1905. He set goal-scoring records in the pre-National Hockey League era, and was one of the original inductees when the Hockey Hall of Fame first inducted members in 1945. McGee was killed in the Battle of the Somme during the First World War. His name is inscribed on the Vimy Memorial in Pas de Calais, France. Frank McGee was born into a well-known Ottawa family. His uncle, Thomas D’Arcy McGee, was one of the Fathers of Confederation. After his schooling McGee remained in Ottawa as a civil servant with the Department of Indian Affairs, and played hockey, lacrosse and rugby. He lost vision in one eye during a hockey accident early in his career, earning him the nickname “One-Eyed Frank McGee.” He continued to play hockey at the highest level despite the risk of losing sight in his remaining eye. At only 5 foot 6 inches, McGee was not the largest man on the ice, but he made up for his small stature with pure skill. Frank McGee was an offensive player, leading his team (the Ottawa Hockey Club, also known as the “Silver Seven”) and the entire hockey community in scoring. McGee began his senior hockey career with the Canadian Amateur Hockey League in January 1903, playing for the Ottawa Hockey Club. He scored two goals in his first game, helping Ottawa beat the Montréal Amateur Athletic Association 7–1. McGee was at his best during Stanley Cup matches. At the time, the Stanley Cup was a “challenge cup”: the champions held on to the cup as long as they could defend it against all challengers. At the end of his first season, Ottawa defeated the Montréal Victorias to become Stanley Cup champions, and then successfully defended their title against Rat Portage (later Kenora, Ontario). McGee scored seven times during the four games against these two teams. In 1904, Ottawa again defended their Stanley Cup title with McGee scoring a then-record five goals against the Toronto Marlboros. Brandon, Manitoba challenged Ottawa for the Stanley Cup later that season and was also defeated. In January 1905, the Dawson City Nuggets challenged the Silver Seven for the Stanley Cup. Ottawa beat them 23–2. McGee scored 14 goals in a single game, a record that still stands. During the 1906 regular season, McGee scored 28 goals in seven games. In February and March of that year, he scored six goals in two playoff games to defeat Queens University, followed by nine goals during a two-game defeat of Smiths Falls. The season ended with the Silver Seven losing the Stanley Cup to the Montréal Wanderers. McGee retired from hockey after the 1906 season. His record of 63 goals in 22 playoff games was never beaten in the pre-National Hockey League era. Despite his limited vision, Frank McGee was eligible for military service during the First World War. He allegedly passed the physical exam by switching hands instead of eyes when the medical officer asked him to read from a chart. When fighting broke out in 1914, McGee was mobilized as an active member of the 43rd Regiment (Duke of Cornwall’s Own Rifles). The following year, he arrived overseas as a 21st Infantry Battalion lieutenant. After injuring his knee in France, McGee recuperated in England. He returned to the front lines in August 1916 during the bloody, nearly five-month Battle of the Somme and was killed in action 16 September of that year. Frank McGee is commemorated on the Vimy Memorial in Pas de Calais, France. In 1945, he was a posthumous inductee to the Hockey Hall of Fame, the first year it inducted members. Frank McGeeA biography of Frank McGee, hockey player, civil servant, and army officer. From the Dictionary of Canadian Biography Online. Francis Clarence McGeeMilitary service records for Francis Clarence McGee from the Canadian Virtual War Memorial. Ottawa Senators: Club HistoryBrief reference to Francis (Frank) McGee from the Ottawa Senators Official Website. Frank McGeeSee a profile and career stats for One-Eyed Frank McGee, star of the legendary Ottawa Silver Seven hockey team. From the Hockey Hall of Fame website.